Nice for big guys, thanks to being highly spacious and having an excellent weight capacity of up to 400 pounds. Can you see it now? It’s a very good inflatabke kayak, and now you have three reasons to buy it, but let’s continue with this summary. Intex Explorer K2 Summary: Why Is It Worth Purchasing? Let’s start with the aesthetics, which are an important part. It looks like a banana honestly, but that’s not a bad thing, because thanks to the bright yellow color it is effortless to spot, which as you can easily guess, is a significant aspect regarding security. But what about stability and durability? These are two major points, and fortunately, the Explorer K2 performs very well in both. Let’s start with the fact that it is built with SUPER-TOUGH™ 30-gauge vinyl over a 1200 denier nylon-shell with internal tubes (I know, it sounds quite strong), so, it has been built with stability and durability in mind. But well, there’s something I don’t like: the paddles. This is something that most cheap kayaks like this one and the Challenger K1. It’s not so bad. Otherwise, I’d not even bother reviewing it, but it could be better. If you are looking for different kayak paddles then we have created our top kayak paddles that you could upgrade to. Moreover, it also has another flaw: it doesn’t perform so well in choppy water. But well, that shouldn’t come as a surprise, because it is budget-friendly, and more often than not, kayaks in this price range are not designed for that kind of environment. But for lakes and tranquil rivers, it is an excellent pick. 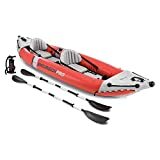 This is something where this kayak stands out from the crowd: it is very spacious and the inflatable seats with adjustable backrests feel quite well. It is even good for big and tall guys because there is enough space and the weight limit tolerates it because it’s a two person kayak. All in all, it’s a fantastic kayak. For the price, it is a no-brainer because it comes with many advantages and just a few cons. So, if you are looking for an affordable two-person inflatable kayak, then here you have a fantastic choice right in front of you! Designed for Comfort and Durability: Welcome the Intex Explorer K2! Similarly to the Intex Challenger K1, there’s plenty where to choose from. The most remarkable aspect where it beats many of the other inflatable kayaks in this price range is the space. It is so spacious you won’t believe it is inflatable. And yes, this has much to do with the comfort factor, because the lesser space, the more uncomfortable you will feel. The fact that it is so spacious also allows you to bring more storage on board like water, food, gear, etc. It doesn’t come with a net, which is a downside, but nothing to worry about in fact. Two people can use this kayak and feel comfortable the whole time because there’s enough space for your legs and the seats have been designed with comfort in mind. So, I can say it scores very high regarding comfort. It is also very lightweight at only 30 pounds, something that makes it very easy to transport and store. It is very resistant because you already know that it is made of SUPER-TOUGH™ 30-gauge vinyl over a 1200 denier nylon-shell with internal tubes, this guarantees you that it will stay with you for ages to come. Although, you also need to take care of it by never exposing it to areas where it could get damaged, because after all, it is inflatable. If a kayak is not stable, then why even bother with it? Makes absolutely no sense, because at the end of the day you will end up falling off and taking a swim. Fortunately, the Intex Explorer K2 will put that situation far away from you! Although it is not designed for choppy water or rough conditions, in lakes, calm rivers and the ocean in a calm day it will perform flawlessly. As long as you don’t go over the weight capacity, you and your partner will be able to kayak without problems. Everything is well-balanced here, so the chances of falling off are quite limited, as long as you use it as suggested: in calm and normal water conditions. To make my review completely unbiased I need to point out the bad side of every product, and yes, the Intex Explorer K2 has a problem other than the paddles. If you look at it you will notice that the seats are black… so what? Well, the fact that they are black makes them absorb more heat, something that will make them hotter than if they were yellow and originate another problem: make the kayak prone to over inflation. Over inflating your kayak is something you must avoid at all costs because it makes it more vulnerable to getting damaged. Therefore, during sunny days, it may not be a good idea to use it for too long. I just don’t get why they didn’t choose other color or simply yellow for the seats. 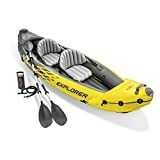 I get that black and yellow look good (it is even the name of a song), they are a good match and everything you want, but the black is a major problem because it retains more heat, and hence, makes the kayak more vulnerable. Designing a kayak goes beyond the aesthetics, and unfortunately, Intex failed here regarding this aspect. Who Should Buy the Intex Explorer K2? Now you can tell if it is the right choice for your or not! As you can see the Explorer K2 by Intex is an excellent choice. It’s inexpensive, super stable, highly durable and very comfortable. Without any doubts a no-brainer! You should definitively go and get it! Great review and I specifically looked up for a K2 review as I saw it in action today, it looked great and could see it way out on a lake from shore and wondered just how good a buy it was as we are interested in buying it or a similar one. Might you have come across an alternative for choppier seas. We are introducing our children to kayaking but are based near a sea estuary, we don’t go far out but it is chopper than a lake. Might you have a suggestion or two to start us off on our search? Would really appreciate any advice.